Recently, I signed up for The Daily Post from WordPress.com–and I’m so glad I did! I usually have a few drafts in my back pocket but the daily inspiration really gets the creative juices flowing. I decided to partake in this week’s photo challenge just for fun and because it had been a while since I’d done a photography post. This week’s theme is “masterpiece,” and it can have a wide interpretation. Almost immediately upon thinking about the word masterpiece, and what kind of image might best represent that concept, one of the photos I shot last year rose quickly to the surface. 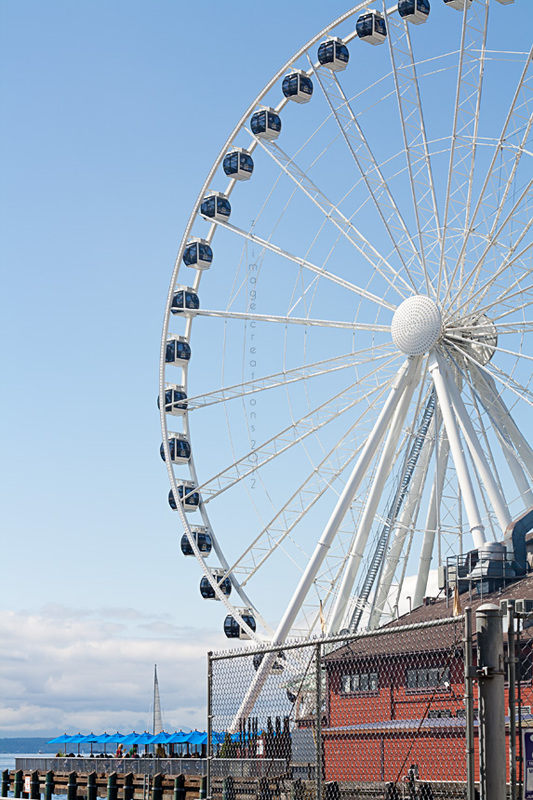 The Seattle Great Wheel towers over the bay and is, in my mind, an architectural masterpiece. It is also a mode of transportation that allows one to go way up in the sky and see some of the most beautiful sights (or, “masterpieces,”) in the United States–those of the stunning city of Seattle. It was difficult to choose which photo I wanted to use but I decided on this one for the composition and because the Great Wheel is only mostly visible; the fact that some of it didn’t make it into the frame suggests how grandly colossal it is. Albeit enormous, it is a graceful sight to behold as it gently completes its rounds.